Hello! 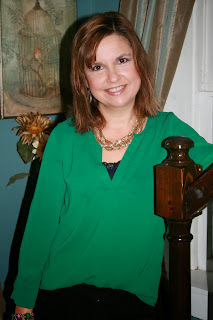 In today's Fashion Over Fifty post I am wearing the beautiful emerald green tunic I received from my last Stitch Fix which I posted HERE. I can't tell you how much I love this top. The color is so gorgeous, and it can be worn so many ways. If your self conscious about your weight or midsection, you can just wear it loose or flowing, you could belt it to cinch your waist, or you can do the 'loosely tucked in the front, but hanging out in the back' like I did in the photograph for a more trendy look. 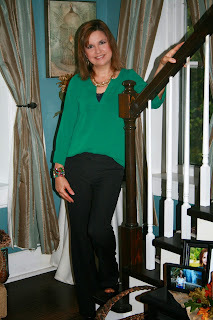 I wore the top with simple black pants from Express, classic black pumps, and gold jewelry. But if you want to be more hip than this fifty year old, you could easily match this top with other bold colors or patterns, like in the looks I found on Pinterest below my personal photos. Here's a close up of the shirt and jewelry that I wore. 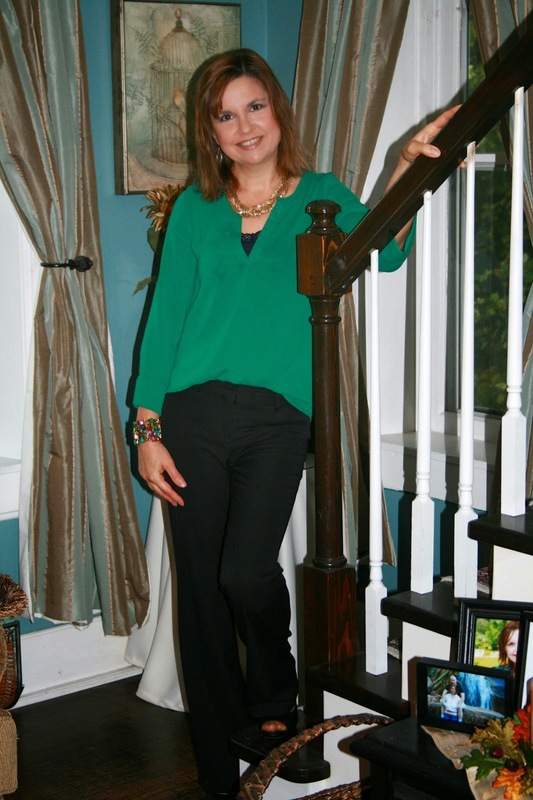 And here is some inspiration from Pinterest on more ways to wear the color emerald green. I'm linking up this post to Friday's Fab Favorites on Style Elixir! You can NOT be over 50! You look so young. Wow, that tunic is gorgeous. Love the color! Love that shade of green and you wear it so well!